Warren Carter leads the beginning student in an inductive exploration of the New Testament Gospels, asking about their genre, the view that they were written by eyewitnesses, the early church traditions about them, and how they employ Hellenistic biography. He examines the distinctive voice of each Gospel, describing the "tale about Jesus" each writer tells, then presenting likely views regarding the circumstances in which they were written, giving particular attention to often overlooked aspects of the Roman imperial setting. A sociohistorical approach suggests that Mark addressed difficult circumstances in imperial Rome; redaction criticism shows that Matthew edited traditions to help define identity in competition with synagogue communities in response to a fresh assertion of Roman power; a literary - thematic approach shows that Luke offers assurance in a context of uncertainty; an intertextual approach shows how John used Wisdom traditions to present Jesus as the definitive revealLer of God's presence to answer an ancient quest for divine knowledge. A concluding chapter addresses how the Gospels inform and shape our understanding of Jesus of Nazareth. 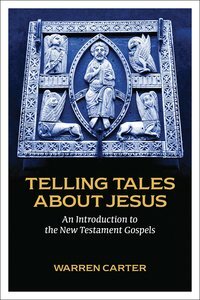 About "Telling Tales About Jesus: An Introduction to the New Testament Gospels"
Warren Carter (Ph.D. Princeton) has accepted Brite Divinity School's invitation to serve as Professor of New Testament. He was the Lindsey P. Pherigo Professor of New Testament at Saint Paul School of Theology. He is also the author of What Are They Saying about Matthew's Sermon on the Mount? Discipleship and Households: A Study of Matthew 10,20, John: Storyteller, Interpreter, Evangelist, Pontius Pilate: Portraits of a Roman Governor and Matthew: Storyteller, Interpreter, Evangelist,Revised Edition. 1. What Are We Reading And Why Does It Matter? ; 2. Telling Stories About Jesus Prior To The Written Gospels; 3. The Tale Mark Tells; 4. Mark's Gospel: Roman Social Upheavals, Propaganda, And Urban Misery; 5. The Tale Matthew Tells; 6. Matthew's Gospel: Editing And Retelling Stories About Jesus; 7. The Tale Luketells; 8. Luke's Gospel: The Kingdom Of God; 9. The Tale John Tells; 10. John's Gospel: Presentation Of Jesus As Wisdom; 11. Conclusion.